During the late 1930s, Camp Workcoeman underwent a building boom. In 1937, the Northern Litchfield County Council built a $4,500 dining hall and the next year added a campsite with three Adirondack shelters. However, that growth was limited to structures, not attendance. The average number of Scouts in camp in the 1930s was no greater than during the late 1920s, but the Boy Scout membership in Litchfield County increased by seventy percent in the ten years since 1929. In those ten years, two recessions and anemic growth weighed down the economy, making it difficult to come up with the seven dollar camp fee. In 1939, industrial production again reached 1929 levels, and recovery finally seemed a real possibility. That uncertain prosperity helped the Northern Litchfield County Council to raise enough funds to pay off the last of its debt from the dining hall construction. However, the council would have to act if that growth was to bring about an increase in camp turnout. As a way of promoting the ninth point of the Scout law and increasing attendance, the council offered a camp savings plan in 1939. Modeled on the United States Postal Savings System, each Scout was issued a booklet with spaces for 70 stamps. For each dime he deposited with the council office, the Scout was one stamp closer to filling his booklet. The council hoped that if a boy could see his progress towards a week of camp, he would be more likely to attend, and more likely to develop a lifelong habit of thrift. 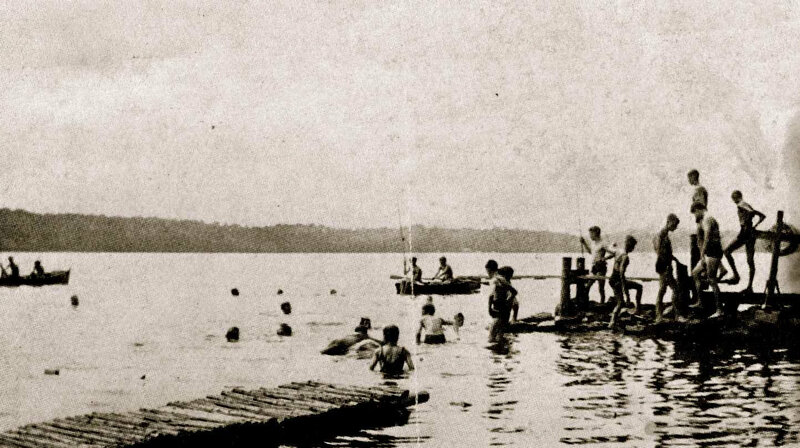 The boys who entered Workcoeman in 1939 dropped their gear into new Adirondack shelters before heading to the waterfront for a swim test. That year, the Council built four shelters in the Poplar Grove Village, adding to the three shelters constructed in Rocky Ledge Village the year before. That summer, the only canvas in camp was for the handicraft tent. In addition to retiring the World War One surplus tents, the Camping Committee also retired Camp Wasuwanee Village, which had only gained its name the previous year, but had housed campers for many seasons. Two campsites made it quite a bit easier for the staff to organize camp sports. While volleyball was the more popular in 1939, the new rivalry extended to the traditional camp sport—baseball. Of course, when challenged by another camp, the Scouts could play together; at the end of week three, the Workcoeman boys headed off to the Alfred W. Dater Council’s Camp Toquam, on Dog Pond in Goshen, to challenge the home team. The Scouts managed to finish the game before a thundershower, but the home team stormed ahead and won the intercamp contest. 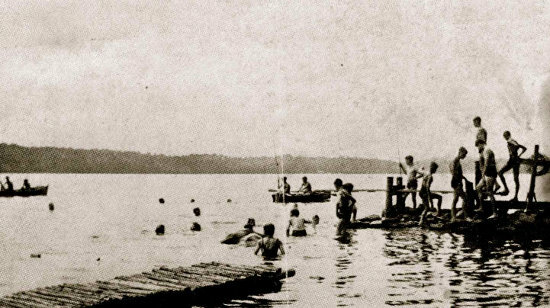 The image below shows Scouts at the waterfront in the late 1930s.